This is an outdated view and is often put forward by contractors (surprise surprise?). Modern DIY spray foam kits are designed to be easy to use, and do not require a complex set up, nor adjustment during operation. Strangely enough, female buyers make up a significant proportion of DIY purchases of foam kits, and they have the least problems using the kits (this is probably due to the fact that women usually read the operating instructions first!) Most problems with these kits occur because users don't read or ignore the instructions. Will the pressure created by the foam push my roof tiles up? No, the foam is sprayed as a coating onto the underside of the tiles and will expand down into the path of least resistance. 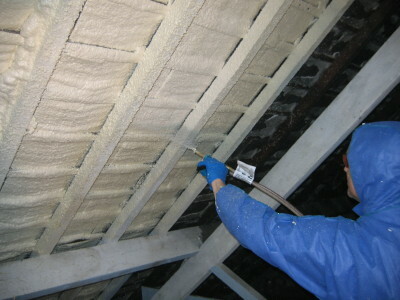 The only way that the foam could possibly push your roof tiles out is if you were injecting the foam into a confined space and you over-injected the foam and blocked all of the injection holes instead of letting the foam expand out of the holes (thereby inducing mould pressure). 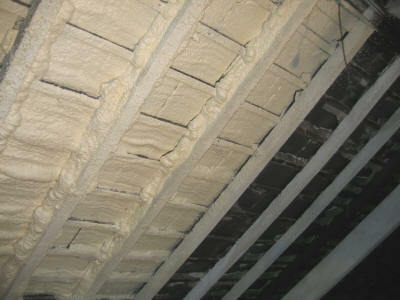 Will the foam insulation include moisture into my boat/home? Will the sprayed foam rot my timbers? No, the foam will neither rot your timbers nor stop any pre-existing rot. If you have any problems with your timbers, it would be advisable that you remedy it before doing anything. 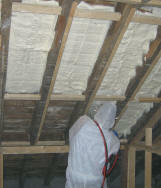 Will the sprayed insulation stop the wood from breathing? No. When you spray the foam on, you never cover more than 3 sides. There is always at least one surface through which, the wood can breathe. Does the foam expand wildly? No. The foam does most of its expansion in the nozzle. The rest of the expansion occurs on the surface you spray onto, or in the cavity you inject into, and is complete in a maximum of 90 seconds. The foam expands approximately 8:1, once out of the nozzle. There is no post-application expansion (several hours later) like that which often happens with single component foams. No, it has an extremely low permeability rating because of the closed-cell structure. It is often used in flotation applications because of this. At a depth of 3 inches, it is a vapour barrier. Is the foam explosive or flammable? No, this is not like an American car from a movie - It will not blow up! Polyurethane foams like all organic materials, will burn under the right circumstances. Fire retardants are added to make it more difficult to ignite. Building regulations also stipulate that all insulation materials should be installed behind a fire resistant structure like plasterboard or render. Put in context, if you look around the room you are in at the moment, there are many items that are easier to ignite than insulation. Furniture generally contains polyurethane foam cushions, curtains and other fabrics are often made from synthetic materials, and many paints and varnishes will burn easily. As most fires start within a room, the biggest hazard comes from materials within the room rather than insulation that is protected behind a fire resistant wall or ceiling.